This past weekend we traveled to Virginia for a wedding and to DC to see friends. It was such a quick trip for the three of us but we had such a great time seeing everyone! I meant to post this recipe on Monday, but somehow during all of the hustle and bustle before our trip, it was the last thing on my to-do list and it just didn’t get done. So without further adieu, I give you our FAVORITE BROWNIES EVER. That’s right, I said it. The word favorite does not get used lightly in our house. Especially when it comes to brownies… just ask my husband. He’s a brownie connoisseur and absolutely loves the Ghirardelli boxed brownies from Costco. They are were his favorite. First of all they’re so easy to make. And they’re relatively quick too! I don’t like making a huge mess in the kitchen and I hate that brownies take so long to bake! This recipe requires melting the butter and the sugar together in the microwave and needs only 25 minutes to bake! To start, like I mentioned above, you’re going to want to melt the butter and sugar together in a microwave safe bowl. This is what gives you that nice shiny cracked top. In my microwave on HIGH, it only takes about 1 minute and 15 seconds. Once the mixture is hot, set it on your counter, stir it together and let it sit for 5 minutes before stirring in the vanilla and cocoa powder. If you add the vanilla too soon it will evaporate and we definitely don’t want that! Once the mixture has cooled enough to where it’s warm, add it to a large mixing bowl or the bowl of a stand mixer. Since I have a KitchenAid I used that. Turn the mixing speed on low and add one cold egg at a time. After the eggs are incorporated, whisk together your dry ingredients in a small mixing bowl. The secret to these thick & chewy brownies is the cornstarch, so don’t skip it! It may seem like a weird ingredient but I thick it adds a wonderful texture to bars and cookies. With your mixing speed on low again, add the dry ingredients to the wet ingredients. Beat on medium-low for about 30 seconds, then fold in the chocolate chips and chunks. 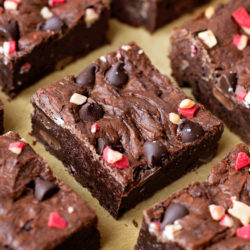 The combination of chunks and chips is key to making these brownies taste like the boxed mix. The chips stay intact in the baking process and give you that “crunch” if you will. The chopped baking bar chunks melt into the brownies and create pockets of silky fudgy goodness. They also help keep the brownies moist and tender. Once the chocolate has been incorporated, pour it into the prepared pan and place it in the oven. Bake these brownies at 325 degrees for approximately 22-25 minutes. Pretty quick, huh?! They should be set in the centers before removing. Let them cool in the pan for 30-45 minutes before cutting and serving… if you can resist for that long 😉 We absolutely loved these brownies. My husband gave them the stamp of approval and said that they were by far the best/closest recipe to his favorite boxed brownies. I can’t wait to make them for him again! DON’T FORGET TO WATCH MY VIDEO TUTORIAL HERE! 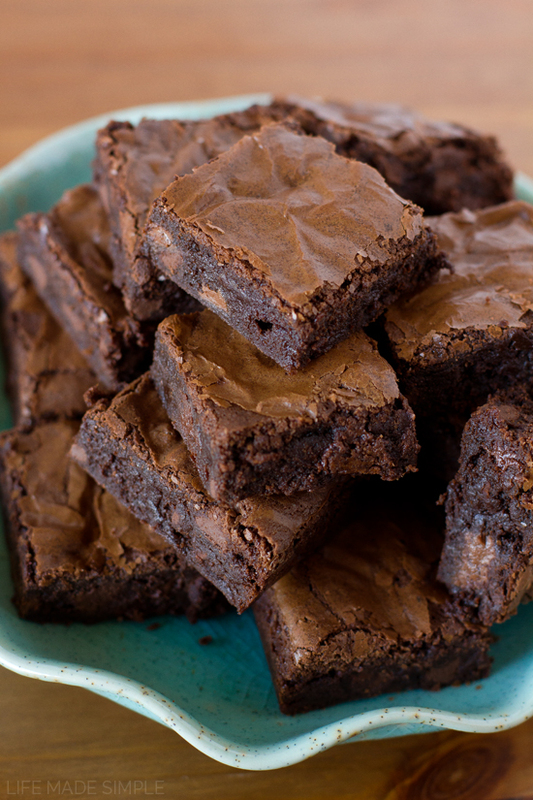 These thick & chewy brownies are so much better than the boxed mix!!! They’re a quick and easy alternative that will have you coming back for more! Preheat oven to 325 degrees. Line a 8×8 inch pan with parchment or foil, set aside. In a microwave safe bowl, add the butter and sugar. Heat in the microwave on HIGH for about 1 minute and 15 seconds. Remove, stir, and cool on the counter for 5 minutes, then stir in the vanilla extract and cocoa powder. In the bowl of a stand mixer add the warm (but not hot) butter/sugar mixture. With mixing speed on low add one egg at a time, mixing just until incorporated. In a medium size mixing bowl, whisk together flour, baking soda, cornstarch, and salt. With mixing speed on low, gradually add dry ingredients. Mix until no flour pockets remain. Remove bowl from stand and fold in the chocolate chips and chunks. Spread the brownie batter evenly into the prepared pan. Place in the oven and bake for 20-30 minutes or until the brownies are set. Remove from oven and allow to cool for 30-45 minutes before cutting and serving. *I love using a Ghirardelli baking bar for the chopped chocolate. -This recipe can easily be doubled to fit a 9×13 inch pan. The bake time might increase by 3-5 minutes. It will make approximately 24 brownies. I used a metal pan for these brownies, not pyrex. *1/2 c. of cake flour can be substituted for the all-purpose flour and cornstarch. Ohmygoodness! These look amazing! They’ll definitely convert any box mix lover! Ok…I was skeptical at first because the boxed Costco ones have always been our favorite too but these are better, and I mean, wayyyyyy better! I haven’t had a chance to make them with the bar yet either, b/c all I had on hand were chocolate chips, but I just doubled the chocolate chips and oh my goodness, these are amazing! We have made 2 batches this week and I just can’t get over how good these are- Thank you so much for the recipe! I love to hear that! We thought these were pretty amazing too! Curious why the cornstarch is necessary? Thank! is it possible to leave out the cornstarch or is the cornstarch crucial? It’s pretty crucial to the recipe- it’s helps give it that unique texture. What’s the measure for the baking soda? There seems to be a typo. Is it half or one fourth of a tsp. Thank you. Can’t wait to try the recipe! So it’s not 1/8 but 1/4 tsp of baking soda? Hi, I recently discovered your site and have been slowly making my way through it while teaching myself to bake. I’m DYING to make this, but I was wondering, if it needs to be doubled for a 9×13 pan, does that include using 4 eggs and 300+ grams of butter? Thanks so much! Hi Jimena! Yes, you will want to double everything. I know that sounds like a lot, but I promise it will turn out perfectly! Both the eggs and the butter ensure that these brownies are moist and chewy! 12-16 depending on how small or big you cut them. Just made these today. Started out thinking of making granola bars and instead wanted chewy brownies that didn’t involve melting chocolate in a double boiler. Used coconut oil for half of the butter and regular white chocolate and semisweet chips. They turned out amazing! This recipe is a keeper! Thanks!! Oh those sound divine! Thanks for giving the recipe a try! I was very excited to find this post and recipe because I made a brownie recipe nearly identical, but without the added cornstarch and baking soda. I liked it, but it’s just a little too dense and fudgy-textured. Whe When I want a brownie, I don’t want cake or fudge, I want that magical in-between state that defines brownies! I previously used the King Arthur flour recipe, but it had too much baking powder, so too much lift for me. I think your recipe might be that magic in-between texture I am looking for! 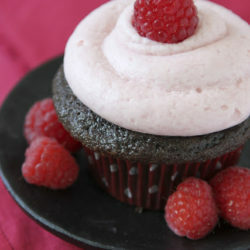 I will probably make these this weekend, I can’t wait! Made the brownies, and they are PERFECT! My tweaks: I browned the butter, and only used 10 tbs., used 1/2 cup natural cocoa + 1/4 cup dutch-process cocoa, used chocolate extract instead of vanilla, added back 2 tsp water with the extract (replacing water lost from browning the butter), baked on rack in lower third of oven. I didn’t include the chips or chopped chocolate, personal preference. Total baking time was about 25 minutes. Thanks so much for this recipe! DIng, ding, ding! I think we have a winner, people. Thank you for doing all the taste testing for us! I followed the recipe exactly as stated. The initial 26 minute cooktime was clearly not enough but I took heed to your warning that any longer and the brownies would be hard. I let them cool slightly and cut across the center to find a gooey mess. I just preheat the oven and I’m on my second round of additional 5 minute blocks? After cooking an additional 15 minutes they are no longer runny. The outer enge is cakelike the center is too sticky and gooey for my liking. I made cookies last night ant the timing and calibration was right on. I dont know what the problem could be. My soda is new. The cornstarch? My elevation is 1600′. I think i’ll look for another recipe. Hmmm… I’m not sure what the issue was. I’ve made these several times and have never had a problem! I don’t think the elevation would have been the problem or and the cornstarch should have prevented any gooey or runnyness. I’m sorry to hear that, I hope you’ll give this recipe another try! I had the same problem. After 40 minutes I decided I would pull them but they were very jiggly. I let them cool over night and although they are tasty they are very soft. I had an opposite effect~! After they cooled the brownies were really dry. Some parts had a nice fudgy part but everything else was dry & crumbly. Why~? I’d say they were probably over-baked or the flour measurement was incorrect. Maybe give them less time in the oven and start there? I’m having the same problem with the doubled recipe. 27 minutes and it was still raw batter in the center. I’m on my fourth 5 minute block and the toothpick is still coming out super wet with batter. Maybe the time needs to be adjusted more for the double batches? An extra 3-5 definitely isn’t cutting it. I had the same exact problem with the original recipe (not doubled). It’s been 30 minutes and the only thing that has baked is the top layer of the brownies. The rest is basically just a brownie batter mess. 🙁 followed the recipe to a T and am always using my oven for baking so I don’t think that is the problem. Will update after more time in the oven. Hey guys. I doubled the recipe as well. I used a dark nonstick pan and baked them at 350 for 35 minutes. This left them well done (just how I like them), so you would probably want to bake them for 30 minutes. Oh no! Sorry to hear that- I’ve never had issues with them turning out crumbly! It really is just a half cup of flour, I promise! I have this recipe down. I use a 9×13″ glass pan, I doubled the recipe and bake at 350 degrees for 40 minutes. They come out amazing…. Ohh, I love that you doubled it and still had success! Thanks for sharing! I doubled the recipe, and used a 9×13 glass pan with the parchment paper,baked 30mins, perfect. Just made these and they are FABULOUS! I bake a lot and have tried dozens of brownie recipes over time, including the much talked about King Arthur Flour recipe. Well, these are even better. Just the right texture; not too dense, not too cakey, not too anything except delicious!!! Thanks very much for sharing. Hi. Just found this great recipe. May i know the exact weight for butter (in gram) in stead of using table spoon. So that i may not reduce or exceed the butter. Hi Amien! I don’t ever do tablespoon to gram conversions, so I just plugged it into an online converter and came up with 11 tablespoons = 155.93 grams. Does that sound about right? I believe 1 stick of butter is about 113 grams, and this is 1 stick + 3 tbsp. I Hope that helps! Sorry i have one more question. Can i just heat the sugar and butter on the pan or double boil it since i dont have microwave. I tried the recipe and it turns great. The taste and the texture really impress me and i would try more your recipes. i just didnt get the wrinkles on top the brownies as yours. So how to get the wrinkles? I used one stick of butter only and instead of 1/2 c of chocolate chips I tried 1/2 cup of chocolate whey protein powder to try it out as protein brownies and didn’t use any bar chocolate and still turned out amazing. Great recipe. These are fabulous! 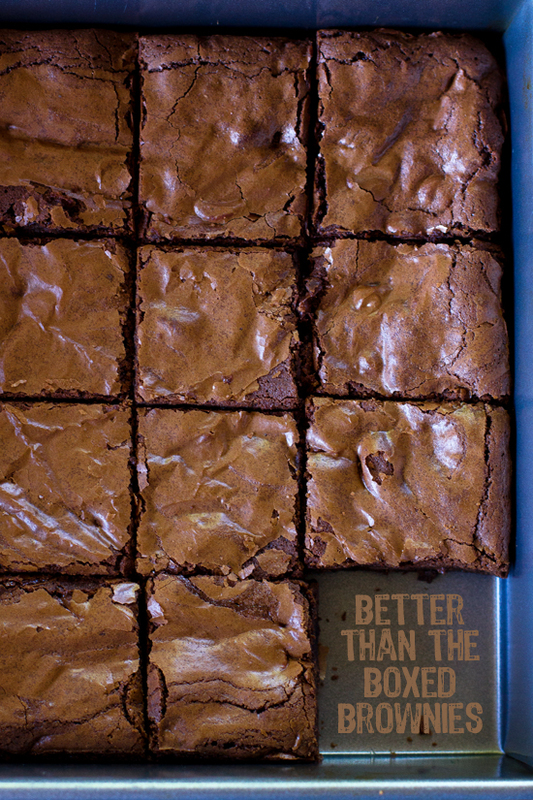 I admit that I like boxed brownies…..but these blow then away. So good, huge hit! These are NOT better than the box; these are waaaaaaaaaaaaaaaay better than box that they don’t even compare. I’ve tried so many brownie recipes, trying to find THE one and I’m so happy to finally say that I just did! I first tried this recipe about a month ago and have been making it weekly ever since. The chocoholics in my family drift is sweet bliss whenever they take a bite out of it. I wish you could see them close their eyes with every bite; you’d be proud. Thank you so much for your effort and for sharing. I wanted to get your permission to make this for my blog, giving you full credit ofcourse with a link back to your post. It’s just that I only share recipes that I fall in love with and this happens to be one of them. Btw your entire blog ROCKS! Thank you! I love hearing that 🙂 Oh, and go for it! P.S. I’m excited to try out your salted caramel stuffed cookie bars… I’m a sucker for anything salted caramel and those look divine! I’ve been eyeballing this recipe for a while now and decided to go for it. Have them in the oven and I’m super pumped for them! I’ve never made brownies from scratch before so this will be interesting. We’ve been gluten free baking for over a year because of my daughter’s celiac, so it’s been a long time since we’ve enjoyed those. I was on the hunt for a great brownie recipe, and I have found it! Could I post my gluten free version of the recipe over at my blog with all credit and a link back to you? I would greatly appreciate it! Of course! I love that you made them gluten-free, I can’t wait to see your version! Thanks!!! I will be posting later this week, but they were so delicious. I made them twice and my daughter was in heaven! I looked n you web page was not able to find the gluten free version of these great brownies. I am having a dinner for my friends tomorrow and I need to make these brownies but gluten free version. Can I have it ASAP please? Ann, I haven’t posted the recipe yet! So sorry, I hope you were able to make something yummy in time. I will be posting the recipe this week. The only substitutions I made were in place of all-purpose flour, use 1/4 cup brown or white rice flour, 2 tablespoons potato starch, and 2 tablespoons coconut flour. Add a little over 1/2 teaspoon of xanthan gum and bake for 40-45 minutes. My brownies weren’t set after only 25 minutes. You could try using a gluten free flour blend, but I am a fan of using my own combos of flour. Better results! The recipe is up! They taste amazing! Can’t even tell you’re getting a gluten free version of these bad boys. Yum! I had the issue of mine not being cooked in the middle as well! I turned my oven up to 350 and the brownies turned out great! Today is a “Gotta have a brownie day!” These look like they will help turn my day around! Thank you! Found this recipe today and made them – absolutely divine! Had to cook it just a bit longer than 25 minutes though. My husband says they’re better than his mom’s (and I have never made brownies before!) Thank you so much! I think the type of pan used makes a difference. I used a glass Pyrex baking dish and baked for the recommended 25 mins in the centre of a 325 degree oven. Then I took them out and let them cool. Cut into it and it was a gooey mess! 15 mins extra in a preheated 350 degree oven. Still a little gooey but much much better. Otherwise, I’m sure it’d be a good recipe. You know how it is when you are expecting to bring a particular dessert and at the last minute, the person you’re making it for changes her mind and you have to come up with something else? This happened to me yesterday, and I didn’t have brownie mix on hand nor an inclination to go the store. I found your recipe, and in a nutshell: They were perfect! The best homemade brownie recipe I’ve ever tried. They were the hit of the party, with everyone taking extras home (I doubled the recipe.) It is just as you describe: like a boxed mix but better. The chewy texture is there, but the flavor is even better. I used a mix of Ghirardelli cocoa and Nestle dark cocoa and Ghirardelli chocolate. Wonderful! Thanks for the great recipe. Very descriptive and thorough!! I have never had such a tasty failure! I doubled the recipe, and they were really oilly. So I tried again. Cut back on butter, didn’t grease the pan and half agained the flour. Still oily. But so, so yummy!! I had to cook an extra 15 minutes. Going to try one more time! I’m a little over 5000′, would that have an effect? Hmmm… I don’t think it’s the 5000′- that’s about where I’m at too. I’ve doubled this recipe a few times, always with success. Maybe try adding an additional tablespoon each of flour and cocoa powder? And if you have parchment paper, try that instead of using any kind of spray or foil. do i have to melt the chocolates. Hi Natalie, this looks divine! Please advise if i would be able to sub the AP flour to almond flour and still be able to get the same chewy texture? I can’t really say because I’ve never used almond flour in them before. If you’re looking for a good gluten free recipe I have one (here) or you could use a cup for cup gluten-free flour for an easy sub. Can I sub the eggs with greek yogurt? I would say probably not. The eggs are essential in creating the texture of these brownies. You could always give it a try, but I’ve never subbed them out for anything. 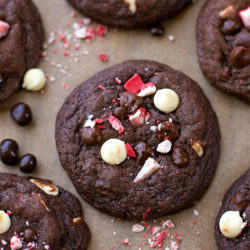 I just tried making these with a flax eggs (1Tbs ground flax + 3Tbs water per egg) and they turned out ok – I definitely needed to bake them longer, I probably baked them for 40 minutes and I think if I make them again I’ll go even a little longer. In my experience when you make brownies without eggs they end up a little on the greasy side, so I may cut back a little on the butter too and definitely do not grease the pan. Overall the taste was nice and even if they were a little gooey at least you aren’t eating uncooked egg! Thanks for letting me know! I’ve never really substituted eggs in a brownie recipe before, because eggs are so crucial to the texture- I’d be more willing to use flax eggs in muffins. I’m glad you’re willing to experiment though, I hope you’re able to find the perfect recipe! Yes, brownies are SO hard to get right without eggs – I tried it again with 1 TBS less butter, 1 Tbs extra flour, and a little extra baking soda and they were awesome! This (with the modifications) is my new go-to brownie recipe, I’m so happy with it! Do you think I could sub the butter for coconut oil? I haven’t tried that before… but you could definitely give it a try (I’ve been meaning to post a coconut oil brownie recipe so now you have me wanting to recipe test asap!) I would probably use 2/3 cup solid coconut oil and then melt it, that way you still get that shiny top! I tried the “Better than the Boxed Brownies” recipe yesterday for my son’s birthday cake. They were fantastic! I doubled the recipe. I didn’t use the cornstarch because I didn’t have any and they were perfect. Will definitely be using this recipe again and again! Each year my family and I create bake sales, so I thought I would find the perfect brownie recipe, and this seems like the one! Since I have no room for failing, I would love if u could answer some of my questions! 1. If I was to bake it in a mini muffin tin, how much time and temperature wil it take for the brownies to bake? 2. Is it okay to use a pot of simmering water to melt the butter and sugar instead of a microwave? 3. Can I just use a rubber spatula or a whisk instead of a KitchenAid? 4. Can I use Hershey’s Choco powder? Yes to 2, 3 & 4… and I’m not sure on 1. I’ve never baked them in a mini muffin tin so I can’t really say, plus the type of material used for the tin will change the time as well. I would do a test batch (just pour batter in two wells of the tin) and bake until they’re set. I would guess that they’d only need 8-10 minutes but you’ll have to see for yourself. Good luck! Do I have to use the baking bar? I don’t have any on hand. Can I substitute equal amount arrowroot or tapioca for the cornstarch? I doubled the recipe and put it on parchment paper in a pyrex 9×13…baked it at 325 for the 25 minutes and it was still cake batter in the middle. So I kept it in there for another 5 minutes and it developed the pretty crust on top so I took it out to cool it to see if it would firm up. 30 minutes later it was still gooey…like batter in the middle. It’s now in the oven on 350 for another 15 minutes and it’s just now starting to get more firm. My guess is that it would take a good 40 minutes on 350 for a double batch. I haven’t gotten to taste them yet since they are on their last stretch of time so I haven’t rated them yet but they smell and look amazing! Definitely had to cook the double batch for an extra 30 minutes! I just wanted to say “thank you” for this recipe! I’ve seen recipes similar to yours, but the addition of cornstarch and baking soda intrigued me. I whipped up a batch yesterday and now I’m in brownie heaven! This is definitely better than the boxed kind. These brownies came out just the way I like them — thick, chewy, crunchy-topped and chocolatey! I like brownies a little sweeter, so I added a little more sugar. I also had to bake the brownies longer. (Mine took about 40-45 minutes.) Other than that, I followed the directions to the letter. Thanks again! You’re welcome! I’m happy to hear that they were a hit! Thanks for the reply! Brownies used to be my Waterloo. I’ve tried several different recipes over the years, but they never turned out quite right……until I tried your recipe. I’m so happy that my search for the perfect brownie recipe has finally ended! I just whipped these up and just had to have a taste before baking – these taste like heaven and already so much better than boxed brownies. Pinning this, thank you. I had to bake a single batch minimum 50 minutes total. It was still super gooey but I took them out anyway. Frustrating…. I made these on Friday night with my daughter. I love how easy they are to make and they tasted so yummy. Thanks for the recipe. These were so gooood!! I accidentally used baking powder instead of baking soda, but everything turned out gooey and delicious! I just made these now, it was really easy to follow the recipe but I cooked them for 30 minutes until the top was cracked and set but after they cooked they were liquidy in the middle. I just tossed the whole pan back in the oven to try to salavage them seems how I made a double batch and didn’t want to waste all those ingredients. The recipe above says 1/8 tsp baking soda but I saw in a previous comment you told someone 1/4 tsp of baking soda. I used a 1/4 tsp for a double batch, which measurement is accurate? Yes, it would be 1/4 tsp. for a double batch. I was looking for a just-as-good or better-than boxed brownies recipe, and this is one tried. The brownies are really good and I think are hitting that sweet spot in the texture that I like about boxed brownies. I had a similar problem as other commenters where the brownies were still gooey batter in the middle after the described cook time. I cooked them an additional 10 min or so then remove the pan and let them cool. I checked it and decided they were cooked enough, so I reheated the oven and did another 10 min. I think they were still a bit under-cooked, but they are delicious nonetheless! I cooked in a glass Pyrex dish lined with parchment paper in the top (small, one-rack) oven of a double oven at 253 feet. I’m going to try this recipe again to see if I can get the desired done-ness. I tried the recipe again and got the brownies cooked through at 350 degrees for 40-50 min. I cooked them in a glass Pyrex dish that was oiled with vegetable shortening. Yum! Made these for the kiddos as a treat today! They were a hit, perfect consistency. I loved how “chocolatey”they are; I am a “bake from scratch” person and have never quite found a brownie recipe that I liked until this one! Thank you so much. hi, will it make any difference if i omit the chocolate chips ? I’l hav walnuts instead? Hi Joy! I can’t really say, I’ve never made them without the chocolate chips. Let me know how they turn out! Hi! I loved this recipe! I wonder for how long can i keep them and how. if it should be in the fridge or not. I want to bake them for teachers day and i wish i could make it in advance. You can keep them for up to 3 days, and I’d suggest in an air-tight container in the refrigerator, then remove them and let them come to room temperature before serving. Enjoy!! These are fantastic! I have made them twice, the first time I tripled the recipe to make one 9×13 and one 8×8. The second time I made one 9×9. I also used dark cocoa powder the second time and I wont do that again. I’m not sure if it was just that difference or if I missed something else but they are just not as amazing as the first time with regular cocoa. i made them on friday, but i really dont know what happened.. i put in the in the oven for 30 minutes and when i check to see if them were ready the knife came out really really wet, so i put them back for just 10 minutes more and then they came out really burned. when i tried them they were very good taste , but they were burn. Can you help me please? These brownies are so amazing! They taste so good. And they look beautiful. Thanks for sharing your recipe. My I ask if it’s possible to make the batter ahead of time and store in the refrigerator for 2 nights? Thank you! Good question! I’ve used both, and either works! I generally bake with unsalted because I always add salt to my recipes, but a little extra salt helps enhance chocolate, so salted would work too. It’s up to you! Hi Natalie, This is a great recipe indeed! The brownies turned out chewy, just the way I like it. The chocolate pieces give it the ‘crunch’ just like you described. I wasn’t able to get the nice white crust, probably because I didn’t heat up the sugar+butter mixture enough. (I aimed for a melting temperature.) But I will certainly be making this again and will give that step another try! On the baking time, some people seemed to have problems getting this to cook in 30 minutes. I baked this in a Pyrex and it took 40-45 minutes at 325F. Instead of poking the brownie to check doneness, I would recommend folks to check it visually first: If at 25 minutes the brownie is still obviously wet and not set in the middle (you can tell by giving the pan a gentle shake), close the oven door immediately and give it another 10 minutes. I watched it to see that the entire brownie has puffed up, and then give it another 2-3 minutes before I take it out. It should sink a little after it cools. I baked these for my coworkers and I had people coming up to me all day long saying these were the best brownies they’ve ever had. Thank you so much for sharing! The brownies are still in the oven, but this is already the best brownie batter I’ve ever licked off the spatula! Thanks Nicole! I hope you love them! Can you add yeast to make them bigger? Yeast? You don’t usually add yeast to anything but bread. I’d say you could up the baking soda to 1/4 tsp. if you want them slightly taller. Hope that helps. What kind of cocoa powder do you use? I used Ghirardelli cocoa powder but I’ve also used Scharffen Berger too. Hope that helps! SUCCESS! Didn’t have cornstarch so used 2 extra tbsp of flour…probably could have done 3. They were delicious! Took approx 30min in oven. Used 9×9 glass because it is all I had. Will try next time with cornstarch and I can’t wait! My husband agreed that this recipe is a keeper! Oh yeah, also didn’t have bakers chocolate so used some ghiradelli dark chocolate chips I had in the pantry as a substitute. Delicious! So happy to hear that… and I love that you used dark chocolate too!! Found you with Google, excited to have just made this as my first recipe from your site! The only adjustment I had to make was that it took 40 minutes to bake. (I already add +10 degrees since my oven runs cool.) They’re DELICIOUS & GOOEY! My only pet peeve, and this is true for so many sites — why don’t you list the ingredients in the order in which they’re used?? Sugar and butter should come first, etc. As it is, there seems to be no sense to the order. Anyway, I had to copy/paste the recipe to word processing and clean it up just to cook, and I don’t find too many worth the work, but liked this one enough to throw in my two cents. Guess I’ll visit a few more pages to see if it’s a trend… 🙂 Regardless, thanks so much for this one! I always reorder the ingredients list to show them in the order they’ll be added too. It means I have less of a chance of leaving something out or adding something twice (which I’ve done… arrggghhh) with other recipes. I’m going to try to make these brownies very soon, even though I’m on a diet, but I’ve got to figure out how to alter the recipe for low altitude (we’re at sea level or maybe 20 feet above at most). Based on a few sites, so far I’ve come up with increasing the sugar to 1 1/2 cups, reducing the egg to only one and using 1/2 tsp baking soda. Most high-low altitude adjustment baking sites say to decrease the flour by 1 Tbsp for a 3500 foot drop and another 1 Tbsp for each additional 1500 foot drop but since this recipe already has so little flour, I don’t if I want to mess with that. Most of the sites say to lower the oven temperature to 300 degrees and increase the baking time by 5-8 minutes. Can anyone offer any other advice? These look and sound YUMMY! I was born and raised in New Orleans (6 feet BELOW sea level), and now live in upstate New York (945 feet above sea level), and I have never had to alter a recipe to accommodate altitude. Ever. But if it helps, I made these brownies in upstate NY exactly as the recipe says, and they came out perfect. Made these today… They are smelling great. I doubled the recipe for a 9 X 13 pan and added the suggested 5 minutes… Yikes! They’re still runny! So far, I’ve added the 5 plus 10, plus 15, plus 10 and finally another 10! That’s 80 minutes. Call me crazy but that’s a LONG time to bake brownies. I made a single batch of these today in a metal pan and the cook time was perfect for me. It was finished at 30 minutes. Then I topped it with chopped pecans. I was going for a Ghirardelli Turtle brownies mix vibe. They were amazing! LOVE this recipe! Thank you for the perfect Brownie recipe. I have been trying to make brownies since few months but was not happy with the results. My son would keep buying brownies from his favourite bakery and would insist me on making the same at home. Luckily I found yours on pinterest. Your recipe was easy to follow and even while it was baking my house smelled divine. And voila!!!! Celebration! !!!! My son was all smiles. Baking another batch tomm (he wants to take it for his teacher’s brother who is recovering from an illness). I made these brownies on Saturday for our yearly chili cook off for church. It was a big hit. Everyone loved them. Even days later people are still talking about them. So, THANK YOU so much for this recipe. I will be continuing to make these. And they are dairy free too. I did double the batch to make in a 9×13 pan. It took an extra 10 minutes, a total of 30 minutes. Also, need to allow them to cool completely before cutting into them or the knife will have their gooeyness. But, loved them. I am super impressed by how easy these were too… I don’t have a microwave so made the sugar mixture on the stove and it worked out perfect! Thank you! I made these brownies last night. They are amazing! I probably won’t ever use another recipe. I doubled mine only added 1 cups of semi-sweet chocolate chips. Just perfect! What happens if my cocoa podwer isnt unsweetened? Hmm… what kind of cocoa powder are you using? Hi I was making these and ran out of cocoa powder think i was a little less than 1/4 c short. So i added about 1/4c of instant chocolate pudding mix and i also sunk 9 mini milky ways into the batter once panned. I sampled the batter after putting in pan and oh my yum can’t wait to try em. Hoping my little fix didn’t ruin em. Also, do you think these brownies would be good paired with a scoop of vanilla ice cream or would i t be too rich? I think eating one with vanilla ice cream sounds like a great idea! So happy to hear that! Thanks!!! I’m going to make these again…was wondering if it is possible to bake them, cool then freeze? My batter did not pour, it was clumpy like a dough. Can you tell me what the batter should look like? This would be so helpful in recipes so I know if I’m on the right track. can you substitute all or some of the melted butter with vegetable oil? Hmmm… I can’t really say because I’ve never tried. Sorry about that, if you do give it a try, let me know! I made these yesterday for a Memorial Day barbeque and they were off the charts delicious! I doubled the recipe ( even the four eggs ) and lined my pan with parchment paper. For my pan I used a metal pan, which I believe to be key in this recipe. I was a little nervous after the 25 minutes when there was still some jiggle. So I added about fifteen minutes to cook time and that’s all it took. Perfection! They are very rich, but those pockets of chocolate are fantastic. I highly recommend this recipe for anyone looking for that out of box experience. I don’t normally write reviews, but this brownie recipe was the exception. 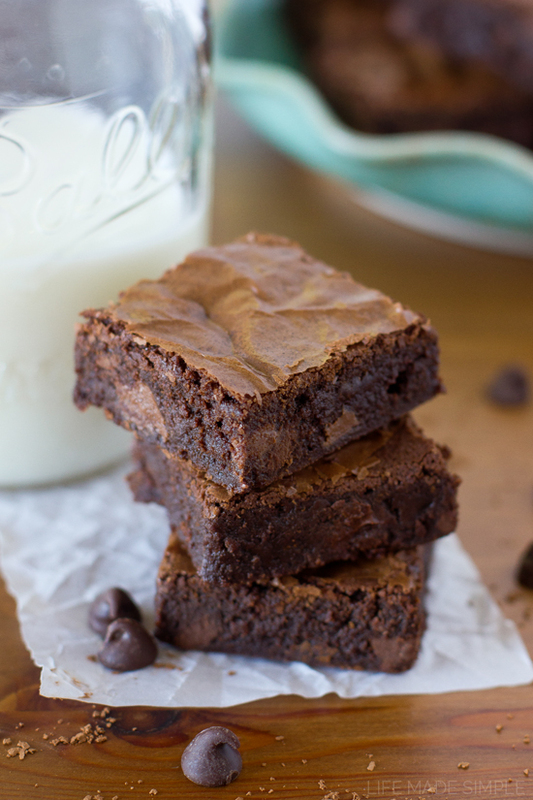 This is my new go to brownie recipe………Again perfection. Thank you for sharing. Thank you, thank you, thank you!! 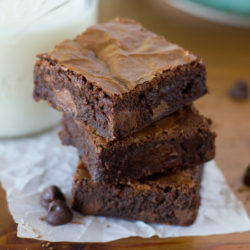 I have never succeeded at making a perfectly chewy brownie until I found this recipe! It was such an easy recipe, I was too lazy to bring out the hand mixer and just used a wooden spoon. Mine took a little bit longer to cook but it came out beautifully. Crackly top and all. The taste and texture was amazing. I might experiment cutting down the sugar next time because I found them a tad too sweet (after the 3rd serving) but the rest of the family loved them and thought the recipe was perfect. do you have a photo of when the butter and sugar is melted? I don’t, but next time I make them I’ll be sure to snap one and put it up! So good! They are definitely better than boxed! Hi, this looks amazing! I am making a brownie dessert on a large round stoneware, will this recipe fit the stoneware? Thank you! This recipe could fit in a 8 or 9 inch round dish or a square baking pan. Hope that helps! Thank you! I’ll let you know how it turns out. These are the BEST homemade brownies I have ever made!! I have tried dozens of recipes but they were all lacking in some way. These are PERFECT. uhhhhmazzzinggg!!! this is the first time I’ve ever commented after trying out a recipe online….I wanted to let others know how great these turned out! I will definitely be saving this recipe. I used one of the individual brownie pans where it gets harder edges and 25 minutes was the perfect time. thank you so much for sharing this great recipe! WOW! I needed a good recipe for simple brownies. I am a chef at a Disabilities Centered Childcare and i have some strict guidelines to follow. These are amazing! I didn’t have chocolate chips or vanilla, so i substituted a dash of cinnamon and Hersey’s Syrup. WOW OH WOW!! I saved this one! I just made this recipe for some dinner guests. I made them ahead of time but the batter didn’t seem set after 20 minutes of baking, or 25 minutes, so I left it in for a full 30 before letting it cool. By the time we cut into them after dinner they seemed to have hardened and I was worried I’d ruined them (I have always liked soft, chewy, melty brownies), but they were absolutely perfect. The mix does make a dense, chewy instead of a melty, chewy brownie (Which I now think I prefer over my old favorites!) but the chunks and chips are a perfectly melty surprise inside that compliments the dense brownie mix. I might try taking them out sooner next time, although they were still completely delicious at 30 minutes too! Ive made similar brownies before and ended up with a gooey soggy center. I finally figured out that it’s the quality of the butter. For brownies in particular use the best butter available…the water content in cheaper butter is too high. Yes! Quality ingredients make a huge difference, especially butter. Thank you so much for your comment! I just made these this evening, and they came out perfect. I followed your recipe exactly. I’ll never understand people who alter the recipe, substitute ingredients, or change the cooking times, and then have the nerve to complain when their results are less than stellar. So typical. Thanks for this brownie recipe! They did indeed taste more like dark chocolate than milk chocolate (due to the cocoa powder), but that’s what makes them perfect for serving with ice cream! Thanks Bridget! I totally agree with you! I made these today and they turned out great. It just melts in your mouth. Am happy with the outcome, but i was expecting it to be chewy. Mine turned out more cakey like brownie, but it still tasted as good 🙂 do you have any tips to get it more chewy? Thanks for sharing. Thanks Naomi! I’d say maybe you over-mixed the batter? You could also try doing 1 whole egg and 1 yolk, instead of two whole eggs. Let me know if you do decide to experiment! Ahhh- I love to hear that! Thanks Suzi!! I want to make these brownies but I don’t have a microwave. Can I melt the butter and sugar in a pot over the burner on my stove? Would that work? How long would I do that for? Over what heat also? Hi Kristin, that would definitely work! I’d go with medium-low heat, and just until the butter has completely melted and the sugar starts to dissolve a bit. I think they’ll still turn out delicious! I made this recipe directly as listed and unfortunately found that my brownies never set. /= I baked them for nearly double the time at 325, and then lowered the temp at baked them for another 20 minutes at 300 and still have a very soft, doughy brownie. I am so confused! They are absolutely delicious and have the most beautiful shiny/crackly top that I have ever seen on a brownie, but they absolutely must be eaten with a spoon or a fork, which is disappointing. Any suggestions? I have the same issue. SO underbaked. I baked mine at first for nearly 30 minutes, took them out. When they cooled they were super gooey (almost batter), so I put them back in for 20 mins and still too gooey in the middle. The middle didn’t even rise again. I’ve tried making this recipe twice! My go to recipe for brownies! Seriously the best brownies EVER! Thank you Stephanie! We think so too!! O..M..G!! Can we give this a 10 star! !My 13-year old daughter and I have been searching for the perfect brownie recipe.Both my daughter and I had our eyes closed with the first bite,and savored every morsel.Most brownie recipes were too sweet.THIS recipe is perfectly balanced.We love the deep,dark chocolate flavor.We did not have a chocolate baking bar,so we substituted it for 60% dark chocolate chips,which is perfect for us.You are right the cornstarch does something with the texture,starts out feeling cakey but then it’s chewy.PERFECT! We have a family recipe book and this recipe is definitely going in it! (I hope that’s okay). We doubled the recipe and it just had to cook it a little longer. THANK YOU,THANK YOU THANK YOU!!! Bringing it over to my brothers house for Thanksgiving (he’s the baker of the family).I’m sure it will get his approval. You are so welcome! Thank you for your sweet comment, it made my day! Amazing brownies! Hubby picked them and I baked them, he ate them so fast !!!! Are you sure that 4 eggs will be fine in the doubled recipe? Every time I make a recipe that calls for 4 eggs to double it my brownies ALWAYS turn out cakelike ???? so I steer clear of recipes that call for 3 or more eggs. I like really dense fudgy brownies so would just 3 eggs instead of the 4 be fine? Or have you made the doubled recipe with dense fudgy results? This recipe turned out perfect! I have searched high and low for a brownie recipe to my family’s satisfaction – I finally found it! I have question: what can I do if I want a mocha flavour? Am I just add coffee? How bout the measurement? Whyyyyyyyy are these brownies SO gooey in the middle after they cool? I baked them for 30 minutes, the middle looked poofed up, toothpick came out somewhat wet. Then after they sit for roughly 30 minutes the middle has completely sunken in and is like batter. I’ve made the recipe twice now and turned out that way both times. Are you using metal or a glass baking dish? I would definitely suggest using metal for all brownie recipes. The flavor was dark chocolatey and amazing, the texture was dense and brownie like without being too gooey. However like several other commenters; mine came out extremely crumbly. I let them cool in the pan before cutting but still they were falling apart before I could get them on the plate. Since we were having them with ice cream and eating with a spoon it wasn’t that big of a deal. I’d like to figure out what happened beforeI would make them again though. I followed the instructions to a T and used quality name brand ingredients without any substitutions or variations. So….. I’m. It quite sure what happened. Any ideas? We loved the flavor and recipe is worth making again if I botched it somehow and can fix. Just made these. Only changed a couple things. Only used 1 stick butter. Added 1/4 teaspoon coffee granules. I also didn’t add any chocolate chips because I wanted to see how they would be plain since I have another use for them. Couldn’t wait until they cooled in order to try them. Delicious! Thick, fine texture, and chocolatey flavor. Thank you for the recipe. These are by far the best brownies from scratch I have ever made/eaten. Followed your directions and they came out perfectly. Delicious fudge-like brownies. OH MY YUM!!! The whole family enjoyed them. Thanks for a great recipe! These brownies are DELICIOUS! I followed your recipe using Ghirardelli Cocoa and the Ghirardelli Chocolate Baking Bar, but I added 1 cup chopped pecans because we are nut lovers and they turned out incredibly yummy! I love the shiny top with a few cracks – they look so beautiful. I used Kerigold butter and baked them in a pyrex glass 8×8 for 35 mins at 325. My man just kept going back for another piece and he literally ate half the pan in about 10 mins. THANK YOU for posting this excellent recipe with all your notes. I was craving chocolate and had all the ingredients, so I thought I’d try a new recipe. The battery was more bitter than box mix. But figured it would taste better after baking. I baked it for 45 minutes, because it was still very wet inside. Edges were burned, but inside (even after cooling an hour) was still battery like. If the batter had taste better, I would have given it another try. But I was very disappointed. I like mine a little gooier than most, so I melted the chocolate chips and chunks into the butter sugar mixture and added about a cup and a half of mini marshmallows before putting the batter in the pan. My tweaks: I added the butter and sugar mixture first, but the vanilla and cocoa powder were added after the dry ingredients. Then, instead of cornstarch I substituted it for 1/2 cup of all purpose flour, so there was a total of 1 cup of flour in the batter. I baked them for about 26 minutes, which isn’t bad. I must say these are delicious BUT I did make several tweaks. First I cut back on the unsweetened cocoa to 1/2 cup and added 1/2 teaspoon of espresso powder. I added 1/2 cup milk chocolate chips and 1/4 cup semi sweet chips. Since we love nuts I added 1/4 cup nuts. Increased oven temp to 350 degrees and baked for 35-40 minutes or until toothpick comes out clean. These were not a dense brownie but light yet not like a cake. Very very good! Did Anyone have luck when doubling this? I e tried twice now and had to cook so long it just wasn’t right after. Tips? These are seriously the BEST brownies I have ever made. However, I would NOT recommend doubling the recipe for a 9×13 pan. 1.5 times is plenty!! I doubled and had to nearly double the baking time and they were too thick. BUT these are a crowd please tell and are a family favorite for sure! My family is desperate for brownies and all I have in the cabin is bread flour and whole wheat flour and I won’t be able to get into town for another week. Can either be substituted? I haven’t tested this recipe with bread or whole wheat flour so I can’t really say. If you do decide to use those, you will definitely need more moisture (maybe another egg yolk and a tablespoon or two more butter). I have to admit I wasn’t looking for brownies when I found this recipe. But omg am I so very glad I did. Literally the best brownie I’ve ever eaten. EVER. This is an amazing recipe! VERY DELICIOUS! I followed the recipe exactly except for two small changes. I only had a bar of bittersweet ghirardelli chocolate, so I used that in place of semi-sweet (this works for our tastes). And I baked them in a square cupcake pan (yeah for crunchy edges on every piece!!!) My oven runs a bit hot, so I baked mine for 20 minutes at 325 degrees…they are perfect! Yay! So glad they were a hit. Thanks for stopping by Hope! Made these for a girl at work who was leaving. She said they almost made her want to stay! I didn’t add the chocolate chips or chunks because I forgot to buy them 🤷 I did however make a cream cheese mixture with a brick of cream cheese, cup of powdered sugar and a dash of vanilla and swirled it on top. I’ve had so many people ask where I got the recipe and I send them here! Haha! Thanks for sharing Jordan! That sounds divine! We love Heath bits! Hey! I have double yolk eggs? Should I put two double yolk eggs or one would be fine ? Made this, and it is delicious.. Thank you for sharing.. My son loves your brownies..
Hello, is the measurement for the baking soda correct? I’ve never seen a 1/8 tsp measuring spoon lol! on an earlier comment, someone asked a similar question and you said to use 1/4 tsp of baking soda. Is it okay if I just use a regular 1/4 tsp of baking soda instead of eyeing it? Will there be a big difference between an 1/8 and a 1/4 of a tsp of baking soda? I saw a couple posts about loose after baking but I’m confident they’ll come out great! Quick question, how do you measure your flour? This past holiday season I saw posts about sifting then measuring. (Not tamping down the flour). This could be the difference in some of the results. Thanks much!! Sounds great! I’ll post afterwards! You’ve made the world a better place because of this recipe. Thank you!! You totally made my day! !